Just so Peter actually resents Jesus washing his feet – because Jesus is so devoted, selflessly, self-sacrificially devoted. Jesus strips himself and lays aside his garments to wash his friends’ feet, like a slave, even as he will be stripped of his garments and lay down his life for his friends, on a cross, again like a slave. 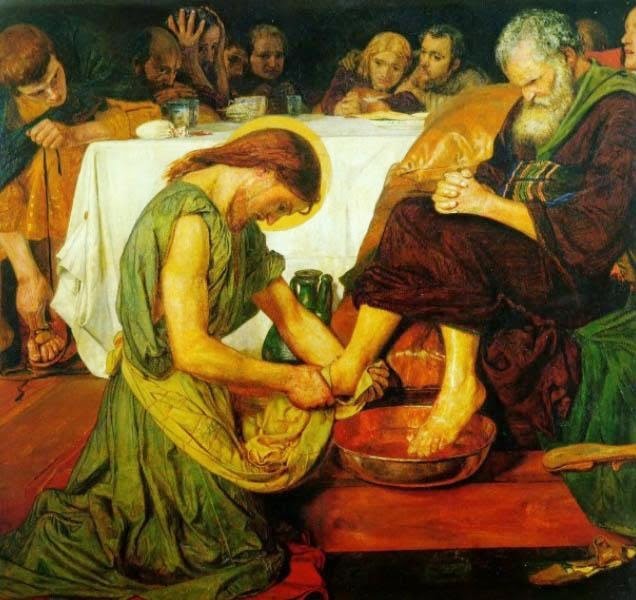 For John, for sure, the foot-washing by Jesus prefigures the crucifixion of Jesus. And, true to form, Peter protests in just the same way at the foot-washing here in the upper room as he did at Jesus’ prediction of his crucifixion at Caesarea Philippi: “God forbid it, Lord! This must never happen to you!” he said then (Matthew 16:22); “Lord, you shall never wash my feet!” he says now. The appearance is humility, the reality is the desire to be in control and secure the social – and political – order of things. Remember the film Gandhi? There is a scene in it where Gandhi meets with his fellow workers for Indian independence. They meet to talk tactics, but Gandhi, who is both a political and a spiritual leader, goes deeper than tactics, goes to the heart of the matter. He speaks to them of what he calls the “secret of service”, the “religion of service”. And he doesn’t just speak, he acts. Like Jesus when he washes the feet of his friends, Gandhi acts out a parable of service – by stopping a domestic who is serving the tea and taking his tray from him. Gandhi insists on serving his friends himself. And, of course, this takes his colleagues aback – they are horrified at this reversal of roles, at their leader acting the servant – just as Peter was with Messiah Jesus acting the slave. Because it is a humble and humbling thing to do, and – further – because it is done as an example to follow: “For I have set you an example, that you also should do as I have done to you” (13:15). They too should act the humble servant, theirs too should be a leadership of service, to the point of … – But that’s just it – there is no knowing where it may lead, this foot-washing and tea-serving, this self-offering, this servanthood, this radical being there for others. Yes, nothing is being demanded of me that I can calculate – but that is precisely what is so staggering, so frightening, so life-threatening, because what is being demanded of me is – me! Well, our Lord couldn’t have spelled it our any better, though tomorrow he is going to pour it out even more – his life, I mean – totally, in fact – in the ultimate act of self-giving, self-offering, body and soul, where it all ends, where it all ended, really ended. So I’ll shut up. But there is one more thing Jesus will to do tonight, to see his friends through the weekend: as well as clean us, with his body and blood he will feed us.